I’ve never been a fan of Halloween. To me, it symbolizes a time of year when I have to stress out over ways to Keep Pets Calm as the doorbell rings for hours on end, and worry incessantly about the small colony of feral cats I feed every day. But even I must admit that these clever folks brought back my holiday spirit with the way they decorated their yards! They sure have gone above and beyond to make Halloween a more interesting time of year (and far more humorous!). We use affiliate links when they are available. Thank you for supporting us by using these links! To get these effects, they ordered some fun Halloween decor for their yard. Here's where you can pick up your own dog, cat, and human skeletons for the holidays. This is such a fun way to decorate a yard or window! We can't wait to see what our readers come up with! Order yours by clicking the photo below to be taken to Amazon. 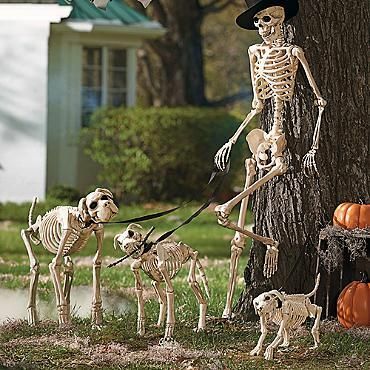 Come up with new ways to decorate your yard using these adorable dog skeletons. Amazon has all sizes available - just click the photo below. These "Pose and Stay" skeletons are designed to mimic the movement of a human body. 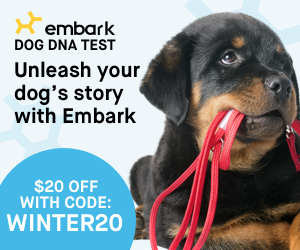 This allows you to pose them in natural ways (just as the real humans would spend a day at the dog park or playing fetch in the yard). These are available in many sizes. Not feeling quite as adventurous? Dress them up! These days, the only limit to holiday decor and lawn art is your own imagination. Here is where you can find some decorative Halloween skeletons in a variety of animal shapes! No reason to fear a rabies epidemic - these bats feature glowing red eyes so you know when they're coming. They also hang harmlessly from trees to make any Halloween yard a bit spookier. Have fun - be sure you order more than one!